Wetlands includes all lakes and rivers, underground aquifers, swamps and marshes, wet grasslands, peatlands, oases, estuaries, deltas and tidal flats, mangroves and other coastal areas, coral reefs, and all human-made sites such as fish ponds, rice paddies, reservoirs and salt pans. Wetlands are vital for human survival. They are indispensable for the countless benefits or “ecosystem services” that they provide humanity, ranging from freshwater supply, food and building materials, and biodiversity, to flood control, groundwater recharge, and climate change mitigation. This was planned especially for schoolchildren. About 250 students from 15 different schools participated along with many local residents. They were taken around the DPS lake and explained the importance of mangroves by experts. This was followed by presentations and talks. An audio visual presentation was made on the need of preservation otherwise Navi Mumbai could be struck by natural disasters like Srinagar. Officials from Forest Department explained the different types of mangroves and their importance. All participants were given a certificate in which he/she will have to pledge saving the wetlands. In association with the Forest Dept, NMEPS organised a mangrove plantation drive. This was done in an area where mangroves had been destroyed. Over 200 saplings were obtained from the Forest Department (mangrove Cell) courtesy Ms. Seema Adgaonkar, Range Forest Officer. Residents, including children, gathered in front of DPS School Navi Mumbai and marched in a procession carrying banners and placards to the plantation site. Despite the wet and slippery mud, all the saplings were planted. Ms. Adgaonkar and Dr. Dhiren Pania, a mangrove expert, explained the different type of mangroves and their importance. It was agreed that such plantations will be done regularly so that mangrove forests can be regenerated. In order to raise the awareness about the importance of Wetlands amongst citizens of Navi Mumbai, particularly school children, NMEPS organized a seminar on the occasion of the World Wetlands Day on 1st February, 2014 at Delhi Public School. The topic was Preservation of Wetlands and way forward. The Chief Guest was Mr. N Vasudevan, Chief Conservator of Forests (Mangrove cell). Other speakers were Dr. Anjali Paranis, Regional Director TERI, Dr. Raju Kasambe, BNHS, Ms Sravani Rao, Principal DPS, Ms. Rituja Mokal, Vanashakti and school children of DPS and Podar International School. Over 350 children from various schools participated and heard the presentations in pin drop silence. The presentations were of high quality and relevant leading to questions from the children. The seminar was appreciated by all and the participating schools wanted more such activities. We would like to thank all the participating schools, speakers and DPS in making the Seminar a grand success. NMEPS members keep a continuous vigil on the mangroves and wet lands of Navi Mumbai to check if any fresh encroachments are being made and debris dumped. In Jan 2013 it was noticed that a temple is being built within 50 meters of mangroves. This is illegal and NMEPS wrote to various authorities to stop and demolish the illegal structure. The temple was demolished after careful due diligence by CIDCO. NMEPS organized a Save Mangroves Walk on Sunday 21st April 2013 to draw the attention of the authorities on saving the mangroves and teaching school children on the importance of mangroves ecosystem. The walk started at 7am from DPS Lake and proceeded along the creek side of Palm Beach Road to TS Chanakya. Over 300 children participated. There were experts who spoke to small groups on the importance on mangroves. The activity was covered by media. On the occasion of the World Environment Day, 5th June, 2013, NMEPS organized a SloganContest for Navi Mumbai school children on the was the UN theme of THINK- EAT- SAVE. There was a positive response and a jury picked up the winners who were given a porcelain mug as a memento. This contest was part of NMEPS’s efforts to involve schools and increase the awareness of children on environment issues. On the occasion of the World Forestry Day, the Forest Range Officer Navi Mumbai organized a mangrove plantation in Sector 58, Nerul. Many members of NMEPS and other Navi Mumbai residents participated. It is important that the Ecosystem is restored and NMEPS plans more such activities in the future. The Lake situated near Delhi Public School in sector 52, Nerul is about 30 acres water body which is a habitat for migratory birds like Flamingos Debris was being dumped and CIDCO had planned to fill it up to develop the area. Residents protested and got a stay from Chief Minister in July 2010. However, debris continued to be dumped and the channels connecting the lake to creek were blocked. As no action was being taken by CIDCO to clear the lake, the society organized “Shramadaan” (a volunteer service) on April 16th 2012. Over 300 residents participated and cleared some debris and cleared water channels connecting the lake to the Panvel Creek. The participants included children and senior citizens who came from all parts of Mumbai. With various representations and follow up with the concerned authorities, NMEPS got a copy of the letter from the Konkan Commissioner dated 19/10/2012 to MD CIDCO advising him to keep the channels connecting the lake to creek are kept open for free flow of water. Furthermore, the Maharashtra Coastal Zone Management Authority (MCZMA) wrote to MD CIDCO on 16.01.2013 mentioning that the Lake near DPS shall not be reclaimed as it is Eco sensitive. In order to increase the awareness about the importance of mangroves, migratory birds, NMEPS organised a nature trail in June, 2012 with the assistance of experts from Bombay Natural History Society. Around 100 people, including children, students and residents of nearby societies participated and became aware of the flora and fauna in Nerul, Navi Mumbai and the importance of the Mangroves in protecting the natural catastrophes. Navi Mumbai Municipal Corporation (NMMC) and The Energy and Resources Institute (TERI) as a part of Navi Mumbai ECOCITY project, has identified the lake near Delhi Public School as an important habitat for flamingos. NMEPS sponsored a sign board on Palm Beach Road, which has a photograph of the flamingos who migrate to the lake and can be spotted. 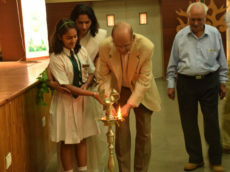 To increase the awareness among the school children, an Essay Competition titled “Importance of the Wetland in our lives” was organised by NMEPS in Feb 2012. The participants of Navi Mumbai Schools were divided in Junior and Senior groups. There was a good response with more than 250 entries. An expert jury evaluated the entries and prizes were distributed the winners in the respective schools. The schools were also presented with Mementos.